Dash – not so brave, dear heart — Writing… or Typing? We’ve had heavy rains around these parts recently (though nothing to what the folks in the Gulf Coast are facing – I’m watching those reports with dread). Dash, always afraid of thunder, now seems to have extended that trepidation to mere heavy rain. Not usually a lap cat, he sniffed at the slider the other morning and insisted on sharing the available space on my lap with my computer. 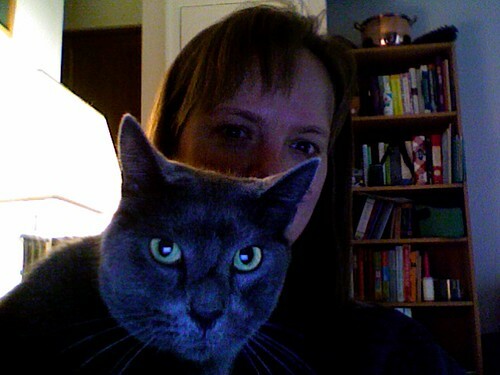 I was able to snag his chagrin with the PhotoBooth program. Poor dear. He looks a little scared. Poor Dash. My late cat Weegee (the Magnificat) maintained a thunder bunker deep in the bowels of this apartment. He always fought these things out alone. Sharon Frosts last blog post..Good to be home. Brooklyn. September 3/4, 2008.